Gavin Creel and Jared Gertner will play Elder Price and Elder Cunningham in The Book of Mormon, which previews at the Prince of Wales Theatre from 25 February 2013. They are currently leading the company in the Los Angeles production, which has broken all box office records at the Pantages Theatre. Other cast members, announced today, include: Mark Anderson, Stephen Ashfield, Benjamin Brook, Daniel Buckley, Daniel Clift, Ashley Day, Terry Doe, Candace Furbert, Patrick George, Nadine Higgin, Tyrone Huntley, Evan James, Chris Jarman, Michael Kent, Alexia Khadime, Matt Krzan, Oliver Liddert, Daniel McKinley, Luke Newton, Terel Nugent, Haydn Oakley, Olivia Phillip, Lucy St. Louis, Giles Terera, Kayi Ushe, Tosh Wanogho-Maud and Liam Wrate. 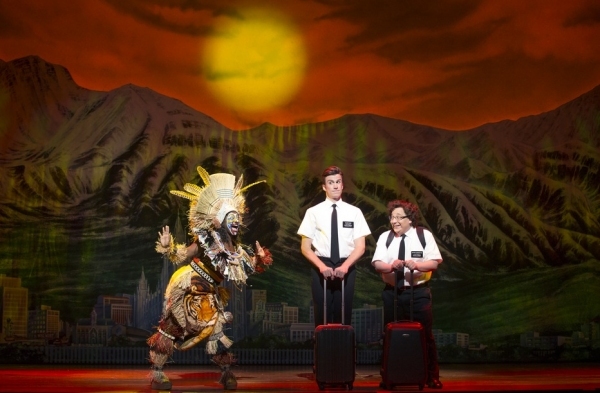 Jared Gertner will make his West End debut in The Book of Mormon. He was a member of the original Tony Award-winning Broadway company and has previously been seen on stage in Spelling Bee at the Circle in the Square Theatre and in Ordinary Days at the Roundabout Theatre. Gertner has also been seen on TV in Ugly Betty and The Good Wife. The Book of Mormon is produced in the West End by Anne Garefino, Scott Rudin, Important Musicals and Sonia Friedman Productions. The Broadway production of The Book of Mormon continues at the Eugene O’Neill Theatre in New York. In September the first national US tour began at the Denver Center Attractions’ Ellie Caulkins Opera House and in December a new company of The Book of Mormon will begin an engagement at the Bank of America Theatre, Chicago. The Prince of Wales Theatre is located on Coventry Street, London, W1D 6AS. The show runs 25 February - 1 June 2013 (current booking period). Performance schedule: Monday – Saturday at 7.30pm (except 21 March, 7pm); Wednesday and Saturday matinees at 2.30pm (first Wednesday matinee on 6 March 2013). Ticket Prices: 25 February – 30 March 2013: £27.50 - £57.50. From 1 April 2013: £37.50 - £67.50. All ticket prices include a £1 theatre restoration levy. Lottery At each performance lottery tickets will be available at £20 each. Entries to the lottery will be accepted in person at the Box Office two and a half hours prior to each performance. Names will be drawn at random two hours before each performance. Check website for further details. Lottery tickets are subject to availability. Call the Box Office at 0844 4825110 or visit www.bookofmormonlondon.com for more information. Matt Stone (book, music, lyrics) and Trey Parker (co-director, book, music, lyrics) met at the University of Colorado, where as students they created the indie film Cannibal! The Musical. Soon after graduation, the pair made an early animation called The Spirit of Christmas. The short featured Stan, Kyle, Cartman and Kenny – four foul-mouthed 4th graders from Colorado – and soon gained the interest of Comedy Central. South Park debuted in 1997 to unprecedented ratings and has since won numerous awards, including four Emmys and the coveted Peabody Award. The same year South Park premiered, they also released their first theatrical feature Orgazmo – which Parker wrote/directed and Stone wrote/produced (a creative balance that continues to this day). Two years later, they took South Park to the big screen with South Park: Bigger, Longer & Uncut, which earned Parker an Oscar nomination for Best Song and the duo the first NY Film Critics Circle Award for Best Animated Film. In 2004, they returned to cinema with their notorious cult classic Team America: World Police, an action comedy starring a cast of marionettes. Stone and Parker spent the next seven years working on their most ambitious project to date – the smash hit Broadway musical The Book of Mormon. Debuting in March 2011, it has since been awarded nine Tony Awards (including Best Musical and Best Original Score), as well as a Grammy for the Original Cast Recording. With record-breaking box office and shows sold out for months in advance, The Book of Mormon expanded its run in August 2012 with its first national tour. The Book of Mormon will launch a second national tour in December and the West End production in February 2013. Stone and Parker continue to write, direct and produce new episodes of South Park, which is currently in its 16th season. Comedy Central has already renewed the series through 2016. Robert Lopez (book, music, lyrics) is a Tony, Grammy and Emmy award-winning composer and lyricist for stage and screen. As well as The Book of Mormon, Lopez co-created the award-winning musical Avenue Q. With Kristen Anderson-Lopez he co-wrote songs for Finding Nemo: The Musical, which has played at Walt Disney World since 2006, as well as the 2009 film of Winnie the Pooh. They are currently writing the songs for the upcoming Disney animated feature Frozen and a forthcoming original stage musical called Up Here. His work has been seen on South Park, The Simpsons and Phineas and Ferb. For his involvement in The Book of Mormon, Lopez won the Tony Award for Best Original Score and Best Book of a Musical. Tony Award-winning theatre director and choreographer Casey Nicholaw (co-director and choreographer) has previously directed The Drowsy Chaperone and choreographed Spamalot, both of which were seen in the West End as well as on Broadway. His other New York credits include Anyone Can Whistle, Follies, Bye Bye Birdie and Can-Can for City Center Encores!, Candide and South Pacific for the New York Philharmonic and Sinatra: His Voice, His World, His Way at Radio City Music Hall. For his involvement in The Book of Mormon, Nicholaw won a Tony Award for Best Direction of a Musical.